Nothing beats vector 2D floor plan drawing software in giving a clear view of a property. With 2D floor plan drawing software, drawing floorplans becomes a breeze! Most of the time, you do not really need high-powered software just to draw shapes and lines. Basic 2D floor plan software might be your best choice to make simple floor plans. It enables you to draw beautiful floor plans even without any previous experience. Edraw Max can be used as 2D drafting software, which includes massive standard built-in floor plan symbols and provides lots of free 2D floor plan templates. Moreover, these free 2D floor templates can be customized according to your own needs. Download free floor plan templates, and make your dream home blueprints. Use bathroom floor planner to create your bathroom designs now! 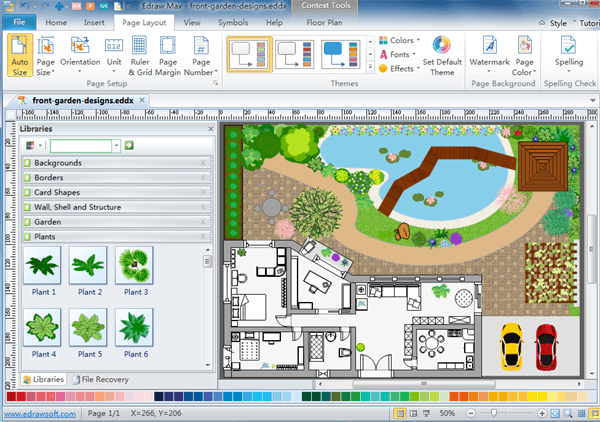 Discover why Edraw is an awesome 2D floor plan drawing tool to make house plans: Try it FREE. Free floor plan templates are awesome!! !--- David from Florida. Easy to use, does a great job.--- Samantha from New York. Better than any competitor. It helps to design the house I want.---Joseph from London. My three kids like the bedrooms we designed for them.---Michael from Hawaii. It is an amazing home plan tool I found online.---Lisa from Miami. I got a beautiful garden with its help. Thank you.---Kate from San Francisco.